An NHS heart doctor has claimed his mother’s vegetarianism contributed to her premature death. 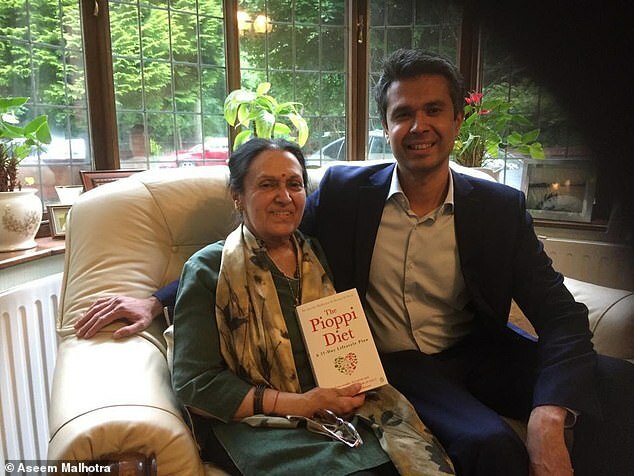 Dr Aseem Malhotra, a cardiologist, said his mother’s health deteriorated because she cut meat out of her diet and she became weak and susceptible to infection. His mother Anisha, a former GP in Manchester, died in December of sepsis – a complication of an infection – at the age of 68. Dr Malhotra said that, although his mother became overweight and unhealthy through eating ‘ultra-processed’ junk food, a lack of meat left her deficient of vitamins and protein which led to her poor spinal health. ‘Even if you take away the rubbish diet, the problem with vegetarianism is you don’t get enough protein and you are at risk of a nutrient deficiency,’ he told MailOnline. ‘With my mum, the fact she didn’t get enough protein was the reason her muscle mass deteriorated and she became frail and vulnerable to infection. Dr Malhotra said his mother developed high blood pressure while in her 40s and had a brain haemorrhage in 2003. She also had arthritis as a result of being overweight and her spine became increasingly damaged over time, including repeated slipped discs. When she died, his mother had discitis – inflammation of the tissue between the intervertebral discs in the spine, triggered by an infection. Her mobility was further destroyed by sarcopenia, a decline in muscle mass he believes was brought on by a protein deficiency caused by her vegetarianism. ‘For most of her adult life, my mum was vegetarian and significantly overweight,’ he wrote in a column for i News. ‘Growing up, I witnessed her regular consumption of starchy carbohydrates and ultra-processed snack foods of biscuits, crisps and chocolate. Acknowledging it wasn’t vegetarianism which killed his mother directly, Dr Malhotra argues the lifestyle choice isn’t synonymous with health and many people who don’t eat meat damage their bodies in other ways. Vegetarians still become fat and may also lack the protein, vitamin B12 and iron – meat-derived nutrients – to strengthen their muscles, bones and immune systems, he said. He gives the example of India, which has more vegetarians and vegans than the rest of the Earth combined, being dubbed the ‘diabetes capital of the world’. This Dr Malhotra blames on increasing consumption of fatty processed wheat, sugar and vegetable oil products. And he adds a majority of vegetarians don’t eat healthily – the Indian Dietetic Association found 84 per cent of veggies are protein-deficient, compared to 65 per cent of people who eat meat. Dr Malhotra added in his column: ‘Sadly, [my mother’s] devout religious faith to avoid consuming animal products, combined with a high starch, high sugar diet, was ultimately to the detriment of her health. Veganism is the best diet for athletes because it boosts heart health, endurance and recovery, according to a scientific review by George Washington University. Athletes, as well as the general public, are increasingly adopting the diet for its reported benefits to health. Venus Williams, Lewis Hamilton, David Haye and Derrick Morgan are already fans, despite their heavy sport schedules requiring strict food. Now, evidence supports that the diet – which uses predominately uses beans and legumes for protein instead of meat – can improve athlete’s performance. Experts said the diet meets ‘all their nutritional needs’, while reducing body fat and controlling weight. The review of dozens of existing studies, published in the journal Nutrients, found a vegan diet plays a key role in cardiovascular health, which is critical for endurance athletes. As well as this, a plant-based diet can provide athletic performance advantages, including ‘leaner body mass, ease of glycogen storage, improved tissue oxygenation, reduced oxidative stress, and reduced inflammation,’ the review said. Because a plant-based diet is typically high in carbohydrates, it should also provide an essential tank of energy for sports players.